Omega 3 Mood is scientifically formulated to support emotional health, brain health and mood. This is the highest EPA formula product that Country Life offers. 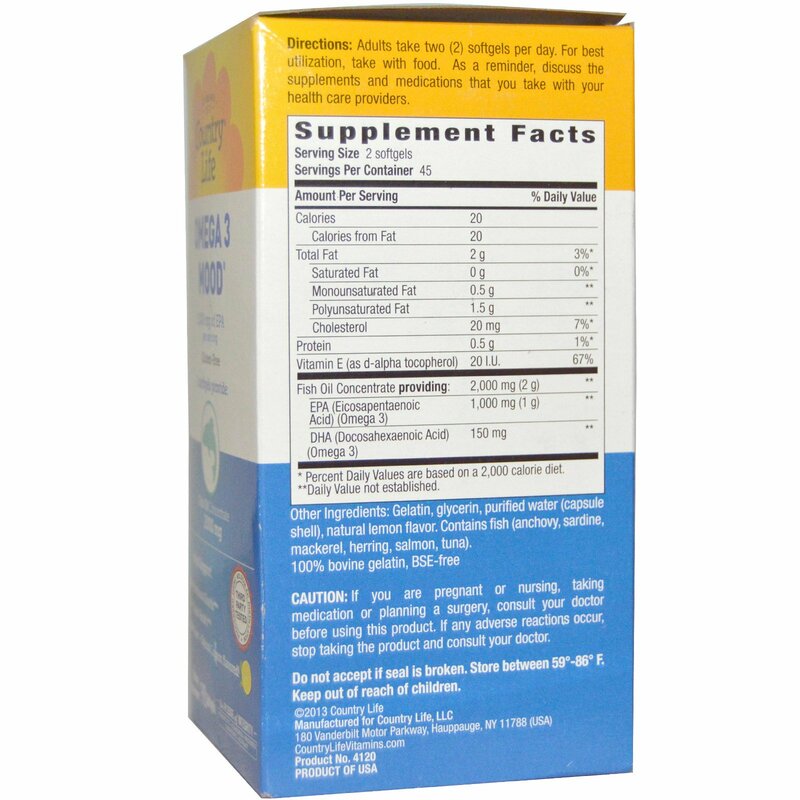 Two softgels contain 2,000 mg of fish oil concentrate and 1,000 mg of EPA. The EPA comes from fish oil, derived from anchovy, sardine, mackerel, herring, salmon, and tuna. It has been processed using molecular distillation to ensure its purity and contains no trans fatty acids. 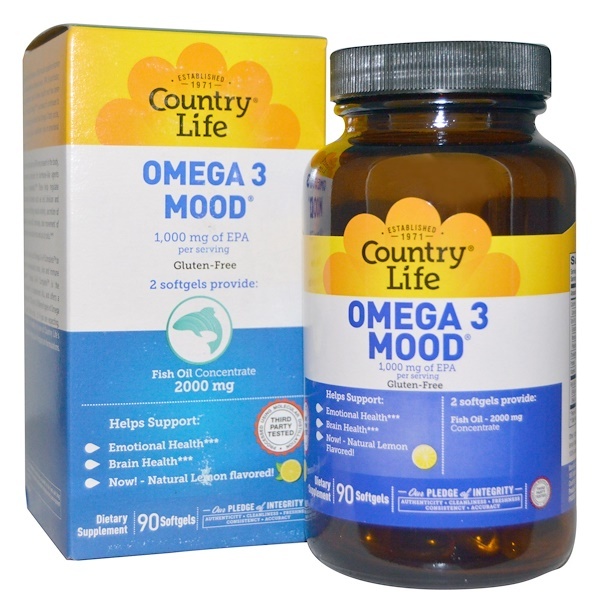 Country Life's Omega 3 Mood is made according to high quality and exacting standards. Each softgel is natural lemon flavored – no fishy taste. Research with Omega-3 fatty acids supplementation has shown promise in many areas. EPA, in particular, plays numerous roles in brain health and has been shown to support mood. As research continues to grow, it is becoming evident that Omega-3 fatty acids, especially EPA, play a significant role in emotional health. When fatty acids such as EPA are present in the body, it becomes a precursor for hormone like agents known as eicosanoids. These help regulate fundamental processes such as cell division and growth, blood clotting, muscle activity, secretion of digestive juices and hormones, and movement of substances like calcium into and out of cells. Adults take two (2) softgels per day. For best utilization, take with food. As a reminder, discuss the supplements and medications that you take with your health care providers. Gelatin, glycerin, purified water (capsule shell), natural lemon flavor. Contains fish (anchovy, sardine, mackerel, herring, salmon, tuna). Yes: Certified gluten free by GFCO.org, recyclable packaging, manufacturing support wind power. No: Yeast, wheat or corn, milk, salt or sugar, preservatives, artificial color or flavor, or magnesium stearate.